On a wooded hillside overlooking the Ardèche River, Mille Étoiles is easily one of the most beautiful campsites in France. The surroundings are riddled footpaths and trails, while the wooded setting gives a wilderness feel, despite the fact that every comfort is catered for – from lanterns at night to toiletries in the wash-rooms. Raised on pine platforms, the 11 yurts are each themed, furnished inside with double beds and bespoke, wooden furnishings, while a pair of safari tents provide extra space for larger family bookings. If wildlife is the only luxury you need, bag one of the camping pitches instead. 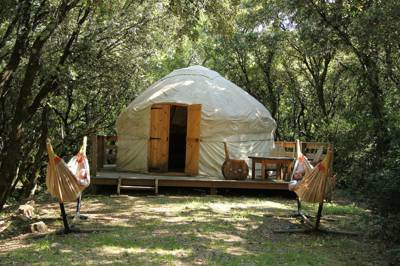 Among the trees of a nature reserve woodland (Le Parc Régional du Vercors), this tiny village of safari tents pioneers next-level glamping. Perched on wooden decks, they're well and truly hidden in the woods yet enjoy views outward from the hills towards the arboreal wilderness beyond. Inside they're kitted out with everything you could need, while, for a cheaper option, there are also 'tunnel tents' sleeping five, with an awning, bedding, towels, and gas stove. Once acclimatised, book a hiking, cycling, or motorcycling package to explore the park, or set off by yourself to simply get lost among the trees. Situated in the quintessential Dordogne hamlet of Le Cambord, La Blanquette Glamping is set on a sprawling country estate. The ultra-luxurious, ultra-spacious twin bell tents, sleep four a piece and are decked out with king-sized beds, jute matting, hand painted bedside tables and dreamy fairy lights. Each has it's own private clearing in the woods, with a shower room, toilets and their own fully-equipped kitchen hut nearby. There is a farm shop and two restaurants within walking distance, plus a complimentary welcome hamper on your arrival. As if a collection of pearly UFOs have landed in the Labourd countryside, Glisten Camping's geodesic domes sit like thoroughly modern hideouts in the trees in the foothills of the Pyrénées. Not all are in the woods, there are six in total, with a couple in a meadow edging the trees, but a most of these remarkable glamping structures reside in dappled shade with a stream bubbling alongside. These stylish pods come complete with partitioned bedrooms, king-size beds and proper mattresses, hanging beds for the kids, and ultra-comfy Fatboy bean-bags. Book early to avoid dissappointment. Nothing says trees like a tree house and nothing says forest like Forest Escapes. This luxury glamping site in Normandy does have other glamping options – there are yurts and a cosy woodland lodge – but it's the tree houses that really steal the show. Raised on wooden stilts, these in-the-canopy cabins offer incredible space and feature double beds, bunk beds and all the furnishings you need – the larger of the two even has a mezzanine floor for the master suite! The range of onsite activities could fill a small novel too: Orienteering, fencing, raft building, wild swimming, canoeing… take your pick!